Sound baths, wave meditation and underwater yoga are all part of Hurawalhi Island Resort’s powerful new wellness offering. Set in the Lhaviyani Atoll, one of the Maldives’ most bio-diverse areas, Hurawalhi’s ‘At One with the Ocean’ program includes a series of mindful practices, movements and therapies which incorporate the healing power of the ocean. With its pioneering underwater yoga classes, wave meditation, ocean-facing sound healing and the most therapeutic blue landscapes in the world, this beautiful collection of unique experiences, together, will truly transform the mind and soul. With extensive research suggesting that oceans can bring a mental shift in the way we perceive our lives, teaching us about calmness, depth, intensity, harmony and open-mindedness, the wellbeing experts of Hurawalhi have meticulously designed a programme to provide guests with a deep inner-connection with themselves, with elements and themes of the ocean throughout. 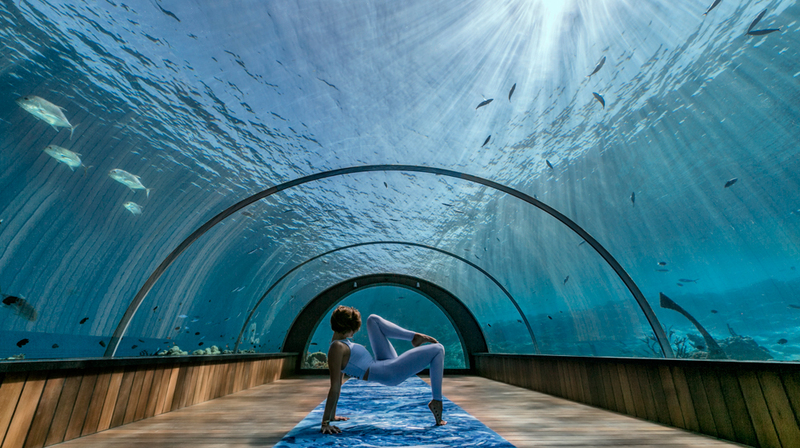 5.8 restaurant, the world’s largest, all-glass undersea restaurant, will be converted in to a yoga studio like no other. The captivating views of tropical fish around you as you move from one pose to the next will bring you even closer to a zen-like state of mind. Dream Island is the perfect location for an unforgettable guided meditation; guests can practice their Ujjayi breathing in harmony with the gentle lapping of the waves. 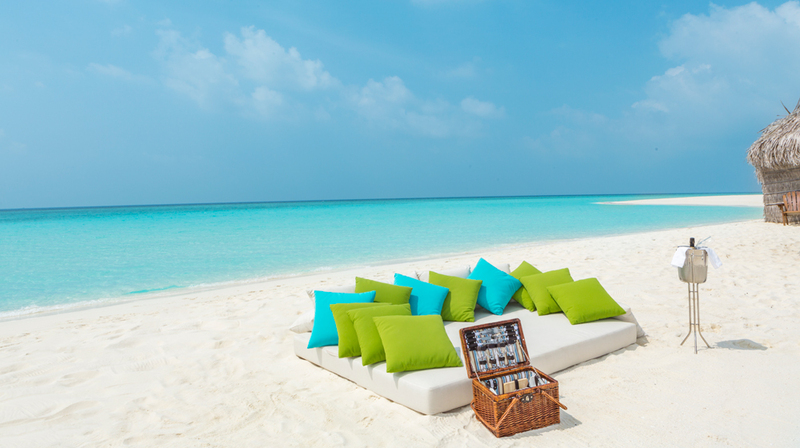 Surrounded by the teals and cerulean of the Indian Ocean, this idyllic sandbank just off the coast of Hurawalhi, captivates the heart and the soul. It is proven that spending time in the water can reduce stress levels by releasing endorphins, which helps instill calm. Home to over 2,000 species of sea life including turtles, dolphins, the majestic manta ray and reef sharks, as well as more than 200 species of coral, the area surrounding Hurawalhi is actually known locally as “The Aquarium”. Sound is vibration, and vibration touches every part of our physical being. Sound is heard not only through the ears, but through every cell of the body. Fall into a deep state of relaxation, meditation and healing as an expert therapist uses a set of Himalayan singing bowls to balance your body, mind and soul. This experience will take place as the sun sets over the sea on Hurawalhi’s beach. Enjoy a gentle, calming massage using acupressure, skin rolling and relaxing strokes to soothe, restore and calm both the body and the mind. 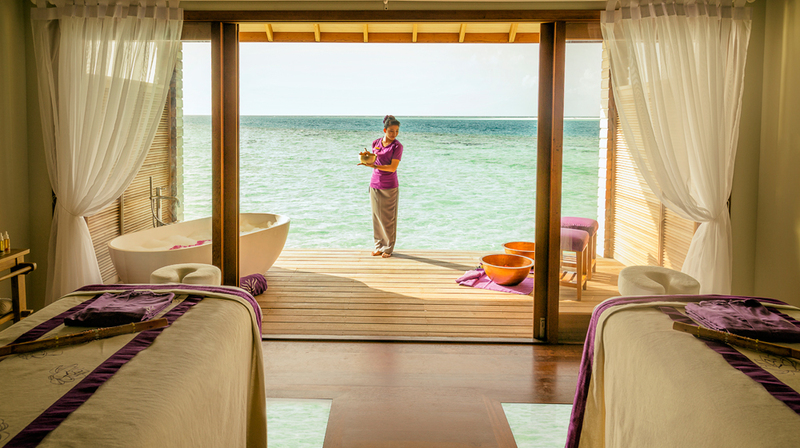 Suspended over the dazzling lagoon on the sunset side of the island, the treatment will take place in a secluded room in a tropical hut built on stilts over the water, where the spa experts invite guests to drift into a state of bliss while listening to the music of the waves beneath.